Behold the SWM-32. It’s the biggest multiswitch in DIRECTV’s arsenal and capable of feeding 32 receivers at a time. It’s strictly for commercial use, since you can’t really use it efficiently to share programs between devices. On the other hand it has some benefits: its output power is stronger meaning longer runs, and it’s designed to accept two power supplies meaning it can work redundantly. 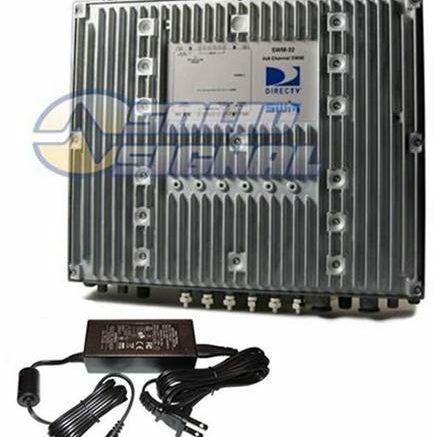 It’s also the only multiswitch that’s designed to be cascaded, in other words you can connect one to another for a total of 64 receivers fed from just 4 DIRECTV cables. SWM-16 multiswitches aren’t designed for that purpose but they can be used that way if you are willing to deal with the uneven output power on the second one. Cascading a SWM-32 multiswitch is actually really easy. Connect cables from the bottom of one to the top of the other. DIRECTV recommends these cables be at least two feet in length. It’s good that it’s so easy, because the SWM-32 can be a bear to set up in other ways. It’s the only multiswitch that requires you to use a separate power supply for the dish, and the inputs at the top are reversed, with the 18V input all the way on the right when you would normally expect it to be on the left. Here’s a quick diagram showing a typical cascaded installation. How can you get smooth fast-forward and rewind on a DIRECTV DVR? Last chance – are you ready for DIRECTV 4K?